I hadn’t meant to hit you with tofu straight after the excesses of Christmas. Truly. It smacks of detox and diet, and other depressing ‘d’ words. If you know me, or read me regularly, you’ll know that’s not what I’m about. I’d rather rub chillies in my eyes, or grate my knuckles on a Microplane ® grater than go on a diet. And as for detox, that’s what our livers are for; we don’t need to go on juice fasts, just stop eating rubbish and drinking alcohol (I know, easier said than done). But also if you know me you’ll know that I love tofu. Or rather, I love what you can do with tofu. Bland beyond belief on its own, I grant you, but when even briefly introduced to things with flavour – I’m thinking miso, soy, chillies, citrus, garlic – it transforms from a simpering slab of blah to a delightful dish of mmm. Perhaps I’m overselling the old beancurd, but I really think this simple, straightforward recipe may change your mind. I actually came up with this recipe ages ago, probably influenced by some long forgotten recipe, or photo torn from a magazine. I remember, when I first made it, the Cinderella-like makeover from pale tasteless cubes to mouth-watering umami silky softness (although back then no-one but the Japanese knew about umami). But for some reason I rarely make it now, preferring to try and develop tricksy and cunning recipes to convince tofu-haters of the folly of their ways. Well, this is neither of those. But it is particularly delicious – and very simple to make. Now that I’ve rediscovered this recipe, I will be making it much more often. Especially because once you have all the ingredients out, it takes all of 10 minutes to prepare. I have blathered on in previous posts about the nutritional virtues of tofu, so if you want the detail of what it is and why it’s good for most of us, see one of my very first posts – Tofu and Aubergine Lime-Basil Stir Fry. The photos are well-dodgy, but the recipe and information are sound. If you can’t be bothered to wade through that post, I can tell you briefly that tofu is cooked and pressed soy beans, made up into little pale blocks. Sounds yummy so far, I’m sure. In those little blocks, which you can find in long-life UHT cartons (these may be the most tasteless), in open containers of brine at Chinese markets (not keen on the germ potential) and in refrigerated packs (favoured option), is one of only two plant-based complete proteins. That should be enough to have most vegetarians hooked, but it is also low GI/GL, low-fat, cholesterol-free, a good source of iron, magnesium and some B vitamins, and a terrific source of calcium, owing to the way in which it is made. It may also help with menopausal symptoms, and reduce the risk of colon and prostate cancer. I mostly use tofu in its unadorned form because I like to flavour it myself, but you can get all manner of titivations – bbq, marinated, smoked, herby, etc – just watch out for too much added fat and salt. Back to the recipe. 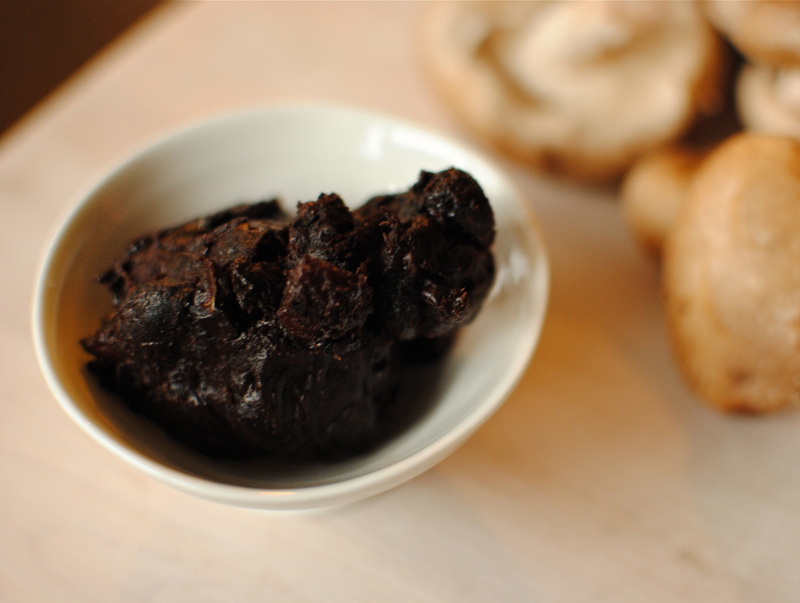 If tamarind paste is a bit tricky to come by, head to your closest Asian grocer. There you will either get a nice big tub of paste for the price of a dinky one at a supermarket, or – what I have – get a bag of squashy, black tamarind pods to soak in water, squidge between your fingers and push through a sieve. The latter does sound a faff, but it’s weirdly pleasing (yes, I’m easily pleased) and no added ingredients. Both the paste and pods keep for a long time. Oh, and if you think you have never had tamarind, think again: it’s a main flavouring in Worcestershire and HP sauces. 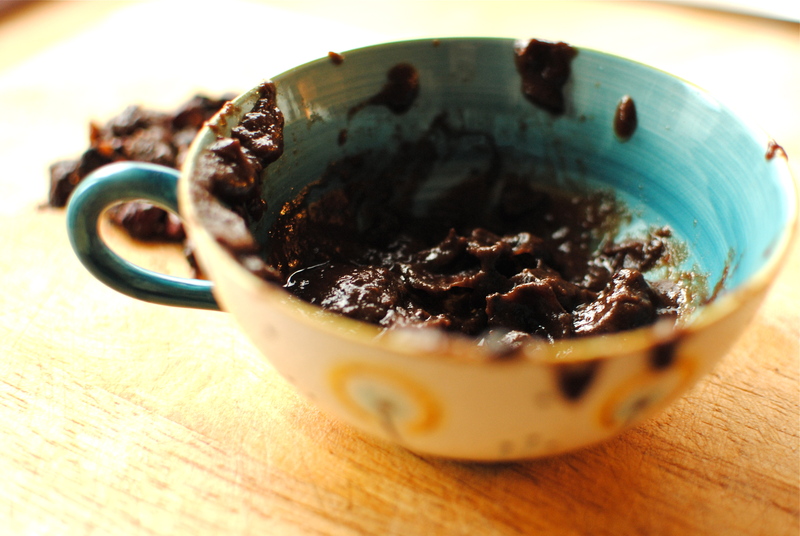 making tamarind paste is messy business - buy it pre-made! And as for the shiitake, fresh shiitake are commonly available but dried shiitake are fine when re-hydrated (various makes available; I use Merchant Gourmet). Although you can really taste the ‘shiitake-ness’ in this recipe, try chestnut mushrooms if you fancy this recipe but can’t immediately find the shiitake. But, please try it with earthy, chewy shiitake if possible. You could make this with chicken breast pieces but it is a super way to give flavour to plain tofu. And it is quick too. 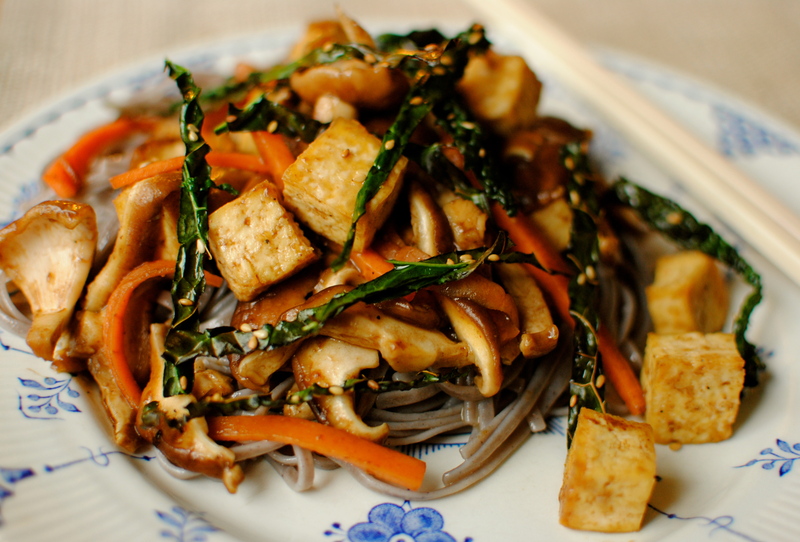 Serve with baked brown basmati rice or buckwheat noodles, and steamed pak choi or broccoli. Preheat the oven to 180C/350F. Spray a baking tray with the oilspray or slick with a little oil; add the cubed tofu. Bake the tofu for about 15 minutes, or until the tofu starts to turn golden but still has plenty of ‘springiness’ when prodded gently. Remove from oven. In a medium saucepan or wok heat the tamarind paste, pepper, sugar, stock and soy sauce. Let the sauce bubble up and thicken for 2-3 minutes. 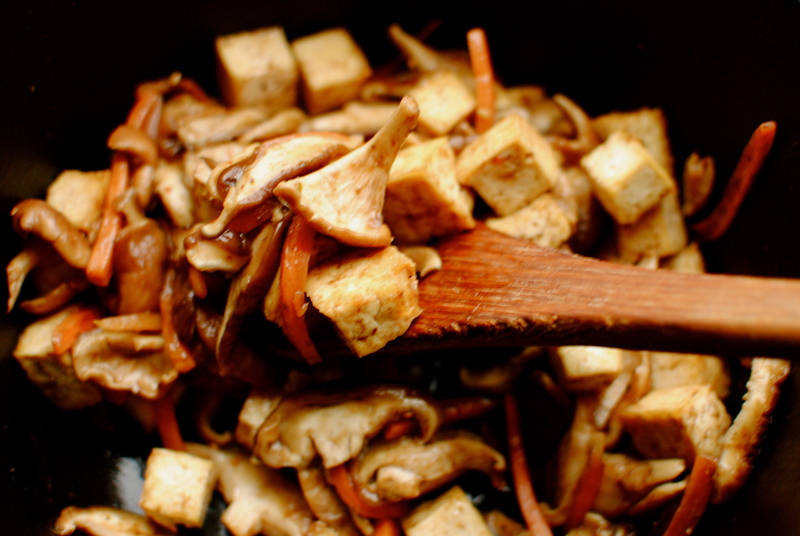 When the sugar has dissolved, add the baked tofu, mushrooms and carrots and simmer for 2-3 minutes. Serve over rice or buckwheat noodles and sprinkle with sesame seeds or the sesame ‘seaweed’ (see below). 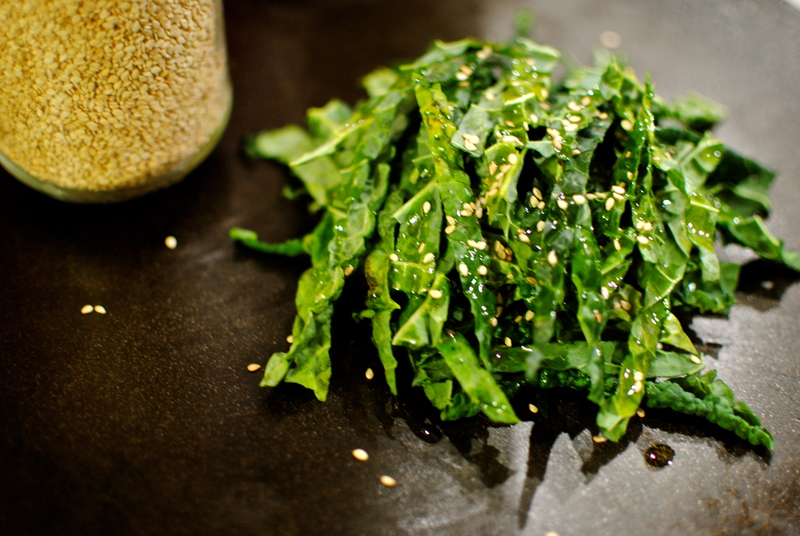 Sesame ‘Seaweed’: Take 4 large leaves of kale (cavolo nero for preference) and rub with a small amount of oil. Remove the ribs from each, stack and cut the leaves into thirds, then take these thirds and slice thinly into matchsticks. Pop these onto a baking tray, sprinkle lightly with sesame seeds, and bake at 180C/350F for 5-6 minutes. Watch the shreds like a hawk as, depending on the type of kale, it may bake more or less quickly. I do this while the tofu is baking. 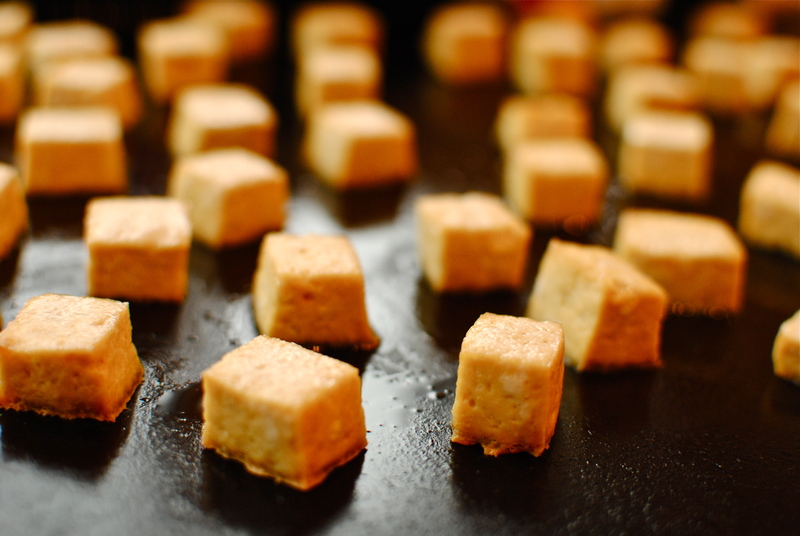 More calories: Gently sauté the tofu cubes sand shiitake mushrooms in 2 tablespoons of rapeseed oil. Nutrition notes: The undisputed star of this dish from a cancer point of view is the mushroom. Shiitake mushrooms contain a fantastic compound called lentinan. This compound is used as a licensed cancer-fighting drug in Japan because of its ability to stimulate the immune system and ‘turn off’ cancer cells. Lentinan also triggers the production of powerful anti-viral, interferon. 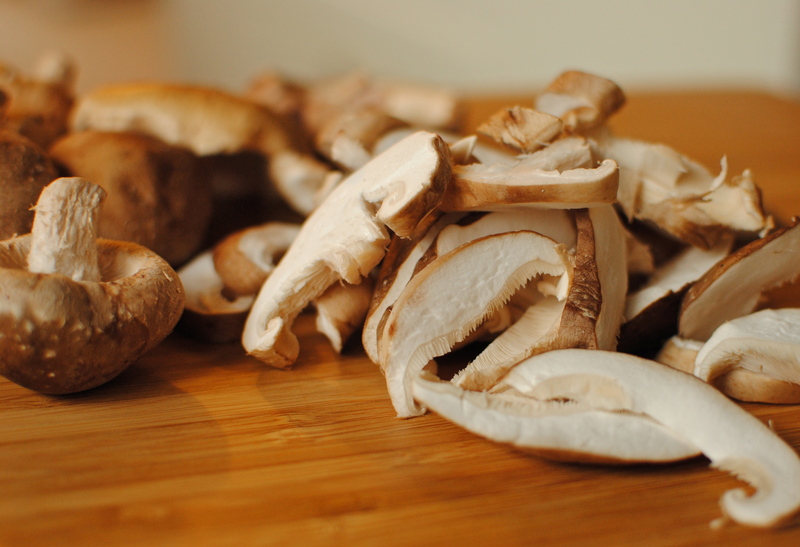 Use shiitake mushrooms in omelettes, stir-fries, casseroles, stews and risottos. Looks delicious Kellie! I was looking for the seaweed in your recipe, then, lo and behold, when I scrolled down a little more, I saw that you used kale. Genius idea! Cant wait to try this! That looks amazing Kellie, such a glow in a bowl…….so many full on and fabulous flavours! That tofu looks perfect! I have such food envy right now! How absolutely delicious! Please pass me a fork. I have a hard time getting my family to eat tofu, but lucky for me, my daughter loves it, so she and I sneak it in once in awhile. I’ve saved this recipe for the two of us. EA, Karen, Heather, Lizzy & Kristi: Thanks for the lovely comments. I know that tofu is a bit of a hard sell but I am so glad you all can see the merit in it. Let me know if you make it, and any tweaks that you do to it. This one is made for customising. Cheers! Proof that tofu really can be anything we want it to be! Your photos are beautiful and this looks absolutely delicious! I will be making this for sure. I am salivating just thinking about it. Great post! I will be trying this recipe. Looks and sounds yummy! And I love the versatility of tofu. Love it! Will be trying the recipe soon…! This looks amazing, I will definitely be trying this with my boyfriend who loves all kinds of Asian foods. Thanks for sharing! Looks like a nutritious recipe. I’ve only had kale 2-3 times –I actually prefer seaweed. And there are different types of edible seaweed. A good Vegan friend of mine is going to LOVE this! Thanks! Love this and your photos! Will be trying this recipe on my (meat dedicated) bf at the weekend. I love tofu dishes. I shall definitely try this. Looks amazing. Your photos are fantastic too. I was just thinking about what new recipe I can try this week-end. Yours is the one that will happen! This looks delicious! I’m excited to try your recipe! carchenigen, but is yet to be sold in the us. looks delicious! Definitely trying this soon. A delicious variety meal for vegetarians. Appreciate it a lot. Whoa. This kind of meal is right my alley. Nice one. It’s not just meat eaters that fear tofu. Soybeans have been receiving a lot of bad rap from the health industry and nutrition experts–the high plant estrogen levels. And of course you want to eat only organic tofu. But me, I still love the stuff and your recipe looks scrumptious. You certainly don’t want to live on a diet of soy as your main protein or calcium source, and those with oestrogen-receptor positive cancer should ideally not have soy more than a few time a week, if at all, but for cancer prevention (and for those with active prostate cancer and with colon cancer) it is something to include regularly. It goes without saying that GMO-free/organic is best, and safest. Thanks for commenting. I tasted tamarind in Calabria, Italy when I was 10 years old. It was used to make “granita”, a dessert consisting of fruit puree on crushed ice. The tamarind “granita” has been my favorite since then. Later on, I discovered that this ingredient is used in some Thai recipes. However, I have to say that the tamarind is a bit tricky. You need to use the right dose or you are going to mess up the recipe. I hope I used the right dose. No complaints so far! I have a tamarind in a few recipes on my blog as I am a huge fan of southeast Asian food. Thanks for the tip about the granita – that sounds scrummy! I love the sweet-sour taste if tamarind and find that making the puree yourself from the pods is the best way to control the depth of flavour and eliminate any fillers. Thanks for stopping by. Wow! This dish looks mouth-watering — I am definitely going to try this! Yum! Thanks for posting it. Awesome pictures! Must be simple food with great taste! make me hungry.. [Uuugh guess I can hear my stomach asking] lol.. Thank you for sharing! Thanks Bernard 😀 IF you type ‘tofu+recipes’ into my search bar up will pop enough tofu recipes to keep you going for awhile, many of them Asian-inspired. What a good idea to use kale instead of seaweed! I really dislike the texture of dried seaweed so I often just leave it out, but this I will definitely have to try. Looks delish and yayyyy for the gluten free noodles! I must try them! This looks and sounds amazing. I am going to have to try this. I absolutely agree with you about tofu too, it is so great at picking up whatever flavors you put with it. Thanks for the new recipe! Thank you, Emilia. I’m glad you are with me about tofu’s transformative qualities. Lots more such recipes on the blog. Tofu, kale & beetroot are my ‘things’. What a fun gal I must seem! Oy….give me tofu-anything and I’m all about it! SO wish I could find even half of those ingredients here in Germany! Great flavor combinations. Thanks for the recipe! 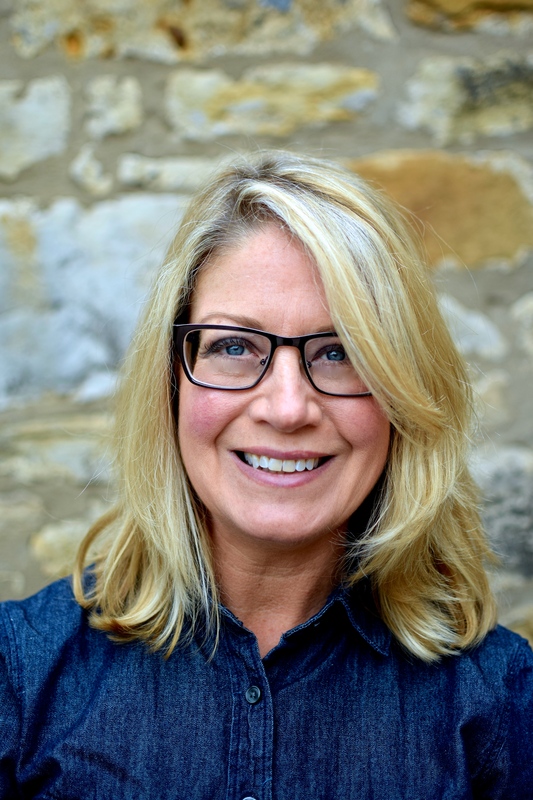 I write a blog about reading, but I seem only to comment on blogs about food. This recipe has me salivating and it’s only 4pm. there’s something a bit schezwan about it. Yum. YUMMMMM! This is amazing and inspiring me to get in the kitchen! Tofu and mushrooms are my top favs. these are nice receipies. I will surely try them at home, even i have a wordpress blog, you can visit it, i will be delighted to see you. my blog. *mouth watering and drooling over* Deliciooooooooooous. I must make this. A beautiful looking dish and recipe. Tofu is so versatile. I’m kind of part-time too! Hubby is making his awesome lamb (maybe even mutton!) curry this weekend for his meat-loving Dad, but otherwise we eat veggie with a few weekly servings of oily fish. Love this balance – so energising for my family. Thanks for finding me. Interesting combination. Gonna give this a try for sure! Never had any leftovers of this but can’t see why it wouldn’t be fine. I hope you, your family & friend enjoy it! omg looks sooo yummy!! def going to try..thanks for posting!! It’s a wonderful recipe, I just bought some tamarind paste, like an inspiration last week but then I was wondering what to do with that. Thank you for the tofu too, appealing in all ways! I made tofu once eons ago and it was such a dreadful experience that I never dared repeat it again. This recipe has me actually considering it! I just love love love tamarind, and your photos are lovely (I love the one of the tofu cubes). I’ve been a pretty boring eater for most of my life but posts like these are encouraging me to step outside of my comfort zone. Oh yeah and I’m trying to decrease the amount of meat that I eat. Thanks so much for commenting. I would love to think my blog might encourage even one person to be a bit more adventurous with their eating. And I hope my recipes show that ‘plant-centred’ eating doesn’t need to be boring & worthy. Any recipe ideas you have are more than welcome. This looks fantastic! 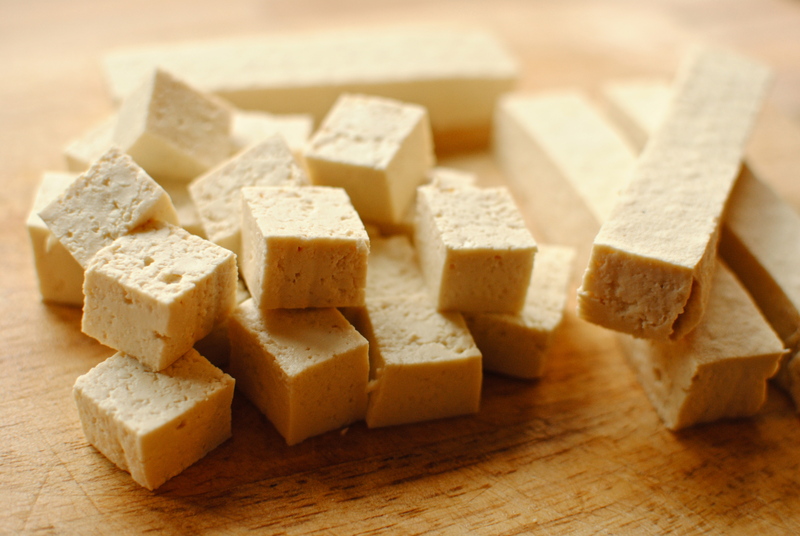 One of the simplest tofu recipes for a snack was served to me by a Japanese woman in Hawaii. It was just a block of firm, with chopped green onions of top and soy sauce poured on top served on a small platter with rather plain crackers. I kept raving about this and to the Japanese I was dining with it was like us eating peanut butter and crackers, they didn’t see what the big deal was. Great post. Thanks for commenting. A similar tofu snack (that looks weird when I type it – a snack? Really?) is as you describe but with the addition of a quick bath in toasted sesame oil, which is a north China thing, I think. I could eat an unfeasibly large pile of this if left to my own devices! Congrats on front page of WordPress!! My traffic has gone up because of referrals from your blog roll so thanks! this dish sounds gorgeous and I love your mug/bowl it’s beautiful! Ooooh, it looks so yummy 🙂 I’ve never tried tofu before so definately excited to give this a go. mouth-watering! I’m an avid fan of shitake mushroom and tofu! and oh! the tamarind twist makes me drool 🙂 Being a vegetarian is rewarding! I’ll definitely try this recipe! That looks simply delicious. Mouth watering. Congrats on being Freshly Pressed, you deserve it with this recipe! Thanks so much! I was very surprised & obviously hugely honoured. A lot to live up to now. Aargh! Great dinner idea, thanks for posting this! When I eat Tofu I suffer from bloating and gas why is this happening . I love Tamarind but can not get it in Norfolk. I ate loads of fresh tamarinds in Thailand which was great . Hi Eva. It sounds like you have an intolerance of soy and should avoid it if your symptoms increase, as constant bombardment of the immune system by poorly tolerated/assimiliated foods is not good in the long-term. But if you enjoy tofu (some of us do!) perhaps get properly checked out to make sure it isn’t something else that you typically eat/drink alongside tofu. But I think this recipe would be nice with organic chicken, although I don’t eat it myself. As for sourcing tamarind, I found this http://www.theasiancookshop.co.uk/tamarind-paste-concentrate-1957-p.asp. My mouth is actually watering after reading this. 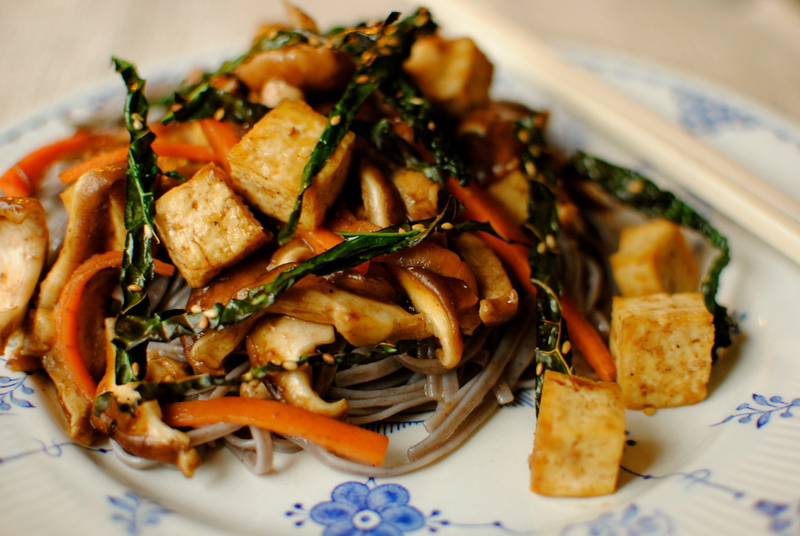 I adore tofu so this is going to be on my “to-cook” list this week for sure. Great post! WOW! I love this recipe so much and cannot wait to try it. 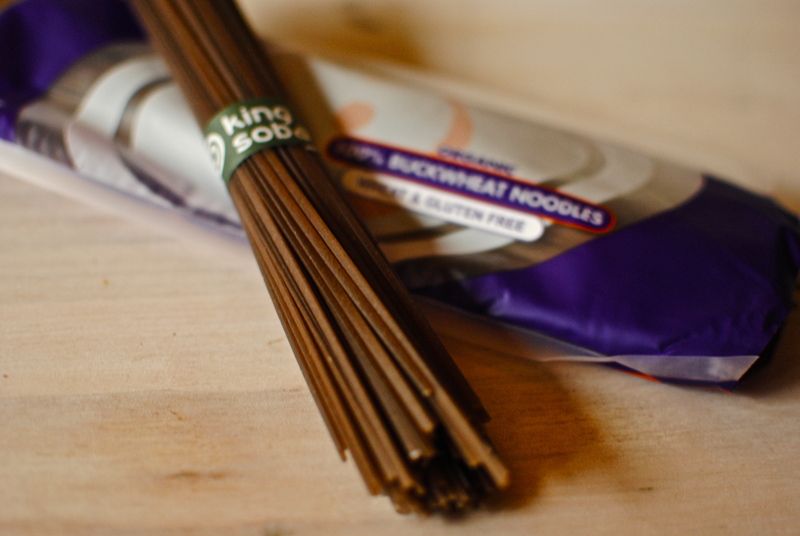 Soba noodles and sesame are two of my absolute favourite ingredients. YUMMO! I have just discovered your blog and I love it. I’m new to blogging and yours is just so impressive. Gorgeous and chock full of info. I think I’ll be browsing around for hours on here. It’s rainy and humid here on the Gold Coast, Queensland so what better way to pass the time? Cheers! Looks amazing!! So fresh and healthy! I really like this post. Those of you who want a daily dose of literature and everything in between, come check out my blog. The mixture of all the elements give the photographs an excellent quality. Plus, the post is very well written.. it’s almost like a book! I could learn from you! Thanks for sharing the tip about the cancer-fighting goodness of shiitake mushrooms. Will have to try this out as it contains a lot of my fave ingredients & would be a great variation on something I already make frequently! Thanks again! This food is absolutely beautiful! I am a WordPress photoblogger, and food is a glorious thing to shoot. Looks delicious! I will definitely have to try this recipe ! 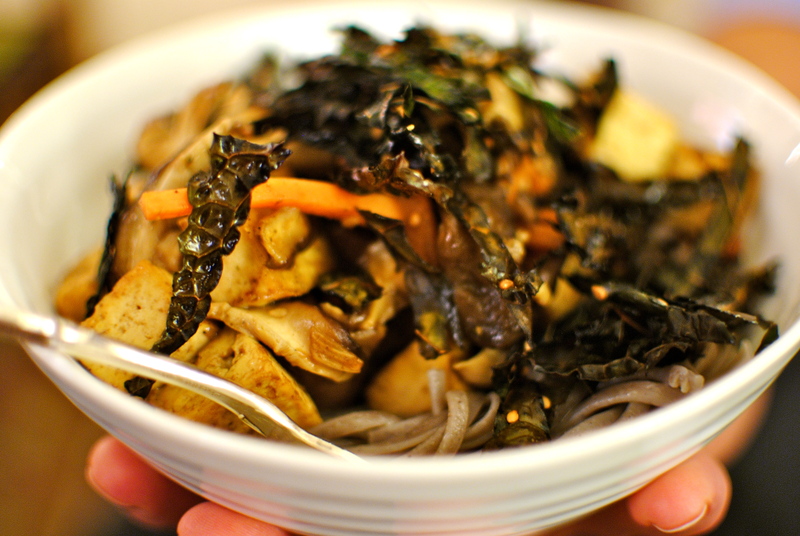 I love the idea of substituting roasted kale for nori, yum! We’ll definitely be adding tofu to our mushrooms. Great call with using the earthy mushrooms if you don’t have shiitake, they are bursting with flavour. Now I have something to make with the tamarind paste I have deposited in an obscure shelf of the pantry. Tamarind rice is yummy-dum-doo. It is not difficult to find tamarind paste, (I live in Omaha, Nebraska). I found jars in one of the local indian groceries. Also, in the chain supermarkets are carrying the tamarind pods in the mexican food section. this looks amazing! also I have to say that when i read “The photos are well-dodgy” in knew you had to be somewhere in the UK, nice photos too! This looks absolutely delicious! Nice post. This is funny and sounds delicious; being a veggie I am always looking for new ways to cook tofu besides my old standard of sesame oil and chili power (also mmmmm, but this looks a little more sophisticated). Great post! Super interesting recipe. When you have the time, do check out my food blog. I just made some gourmet cupcakes and would love to hear what you think. This makes me hungry, but I just ate lunch. Bummer. I love finding new ways to do tofu, thanks for posting! Funny – I was thinking of tofu for dinner tonight! Have decided to implement a meatless Monday protocol at home, followed by tuber Tuesdays!!! Your recipe has me convinced that i should run back out to the shops to collect the missing ingredients! Great minds think alike! We are meatless most days (Tofu Tuesday etc) but I do enjoy the odd steak & lamb curry. Emphasis on odd! This looks delicious! 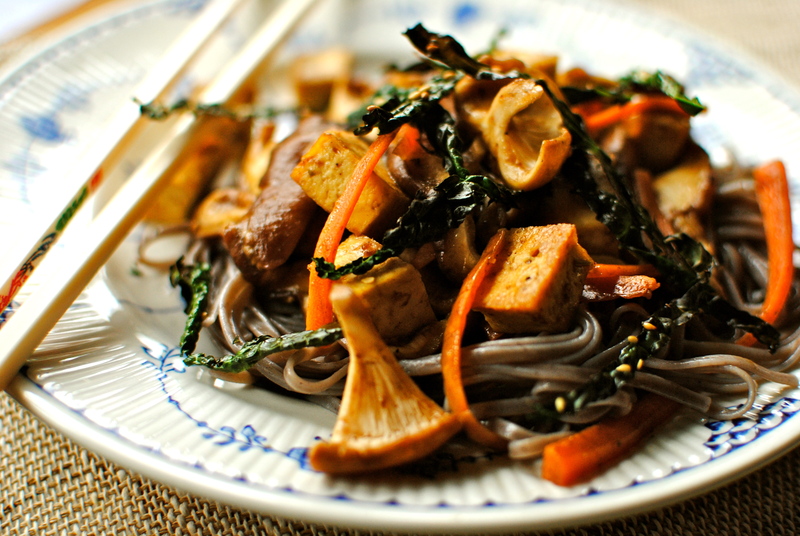 It has everything I love in a dish; kale, soba noodles, sesame seeds and shiitake mushrooms are some my all time favorite foods. I know I will be saving this for one of next weeks meals. I’ll come back and share how it goes with my kids. Omigosh that looks good! I’m always ready for a good tofu recipe, as I don’t know much about actually using it as itself in a recipe; generally I just use tofu as a substitute for cheese, eggs, etc to make my recipes a little healthier. I loved the kale seaweed. Such a lovely idea and beautiful pictures.. You could also add an asian chilli sauce to enhance the taste. Tamarind paste is used extensively in Indian food especially in sambhars, chutneys and also with rice. That’s an easy one, I’ve got virtually all those in apart from sugar which I never use, and the shiitakes. I’ve probably done a variation on your recipe, apart from using those specific mushrooms and the cavalo nero. Best I go to the shops (and see if they have those two goodies) and come back and browse later. It looks beautiful. Love your photographs!